Saturday - November 5, 2011 - 1:00-5:00 p.m.
CLICK HERE to see student film about tour - This was filmed by a video student, Jennifer Pinckney, at Nossi for a school project. 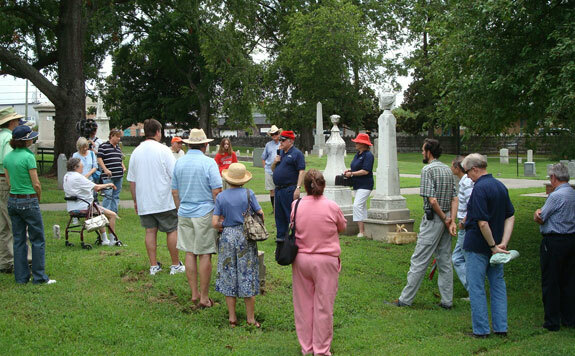 Our most popular City Cemetery event, where costumed reenactors bring the history of Middle Tennessee to life. $5.00 for adults. $10 for families. CLICK HERE to see newsletter article about tour. CLICK HERE to see press release. 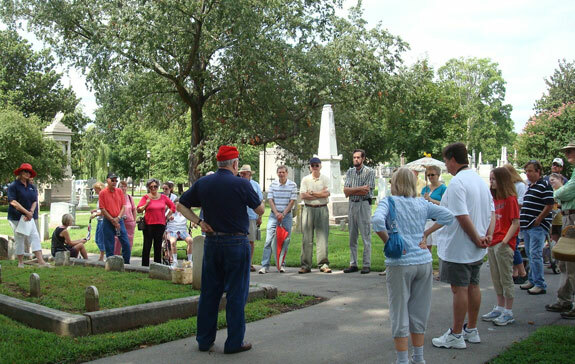 Saturday, December 3, 2011, 10:00-11:00 a.m.
Part 2 - "The Lost Battle of Nashville" focused on Sgt. 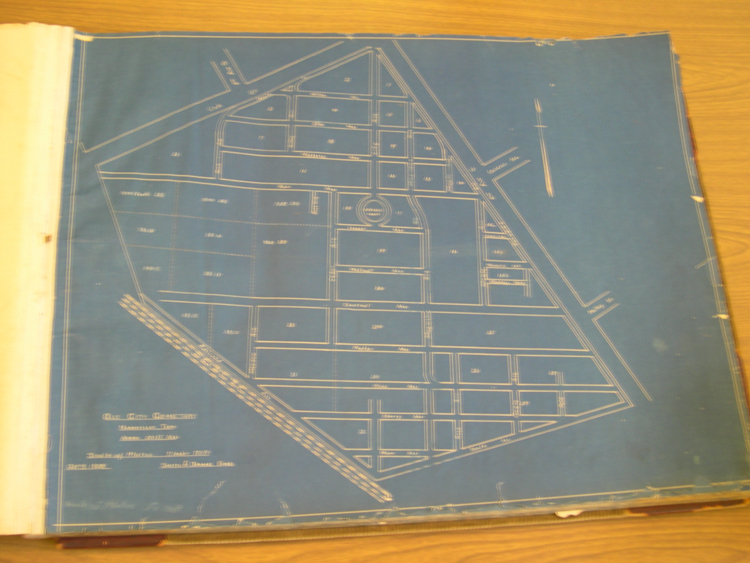 White Turpin and related his battle to the businesses and modern landmarks that occupy the battlefield now. e.g. various McMansions and condominiums, the Donut Den, the Lipscomb soccer field, J. T. Moore Middle School, Calvary Church, presenter John Allyn's back yard, etc. Free. Saturday, September 17, 2011, 10:00-11:00 a.m.
"African Americans in the Civil War" – Black Southerners played an active role in gaining their own freedom. 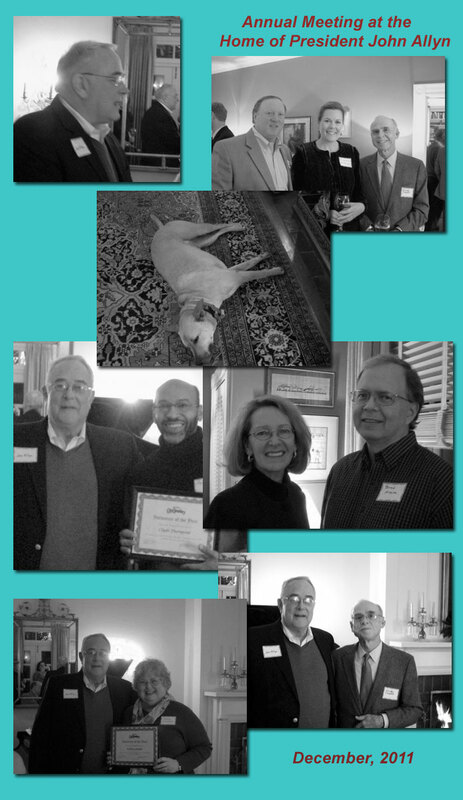 Participants learned about their many contributions on this inspiring tour. Free. Saturday, July 16, 2011, 9:30 a.m.
"What Were They Thinking?" – A fascinating excursion through City Cemetery lore that examined some of the odd military decisions we have always wondered about. Free. CLICK HERE for Press Release about this event. Monday, May 30, 2011, 8:00 a.m.
NASHVILLE, Tenn. - Nashville runners celebrated Memorial Day Monday morning with a race to benefit the Nashville City Cemetery. 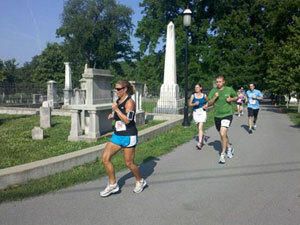 All the money from the Memorial Day Dash goes to restore and preserve the cemetery. It's Metro's oldest cemetery where former mayors and American veterans from the Revolutionary War are buried. Registration was $25 in advance and $30 on race day. It started at 8 a.m. at Greer Stadium and ended at the city cemetery. Nashville Mayor Karl Dean took part in the run and gave a bit of advice before the race started. "You know my advice is always the same in these runs. I start strong, and then taper off," Mayor Dean joked. The Boy Scouts lead a brief flag dedication ceremony at the end of the race, and they placed flags on the graves of 75 American veterans. The Nashville Tree Foundation sponsored the 2011 Big Old Tree Contest and announced the winners at its 24th Annual High Tree Party on April 29, 2011. 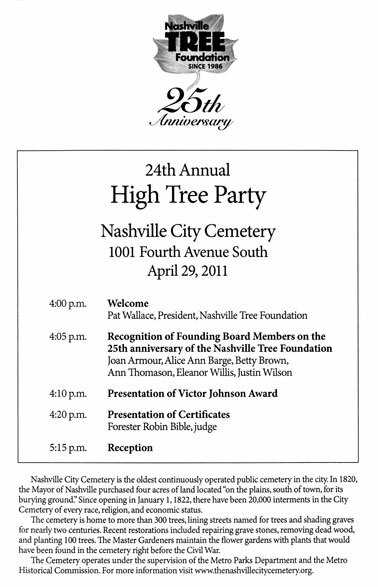 The five City Cemetery trees nominated by NCCA board member, Lyn Cate James, were among the 2011 Champions. 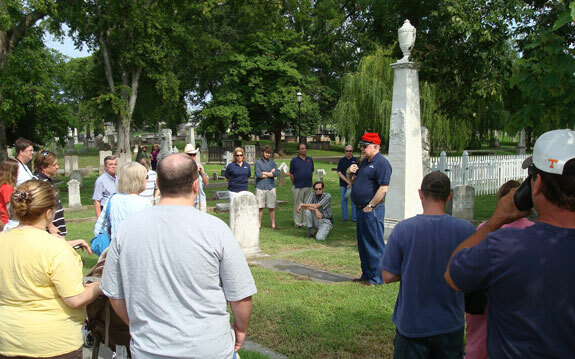 Saturday, April 9, 1:30 p.m.
Can you name the fifteen Nashville Mayors who are buried in the Nashville City Cemetery? Do you know which one of them is currently missing a grave marker? Mayor Karl Dean and the Metropolitan Historical Commission honored the Mayors who served Nashville from 1818-1857 and 1961-1963 at the first Mayors' Day event at the City Cemetery. The afternoon program featured a performance by students from the W.O. Smith Music School, speakers stationed at each mayor's gravesite, and Mayor Dean unveiling a new cedar head piece for the "unmarked mayor." CLICK HERE to read press release.